Reservations should be made at least 48 hours in advance. Forms of Payment: Payments can be made in cash or with a credit card. If you have a reservation and no longer wish to travel, please contact us to cancel your reservation. Unpaid reservations are not guaranteed. Passengers checking in with tickets purchased online with a credit card are required to show valid government-issued photo identification upon check-in. When traveling from our Orlando Terminal, check-in begins an hour before departure time. Customers must be checked in by the Jet Set Express receptionist between 60 and 30 minutes prior to the departure time to retain their reservation and avoid cancellation. Any customer that has a reservation and checks in after this time is no longer guaranteed his or her seat. No changes or cancellations within 24 hours of the departure date. Changes are accepted when made at least 24 hours in advance of the departure date. A credit for the full amount paid must be used within 30 calendar days of the initial departure date. If you have a reservation but no longer wish to travel, please contact us to cancel your reservation. Jet Set Express, Inc. will only use your personal information to contact you regarding special promotions, events, and reservations. To build a good reputation, it is necessary to keep a close eye on changes and take proactive actions to satisfy customer needs and exceed customer expectations. We are committed to providing safe, well-maintained vehicles manned by an elite group of professional drivers whose mission is to make every trip an extraordinary experience. If you are unsatisfied with the services you received, or you have any suggestions to help us offer better service, we would love to hear from you! Jet Set Express' pick-up and arrival times are estimates and are not guaranteed. Jet Set Express is not responsible for delays caused by breakdowns, road, traffic, weather, or other conditions. Any delay or deviation from scheduled times and/or substitution of services from another company will not merit compensation. In the event of a delay or deviation from scheduled times caused by breakdowns, road, traffic, weather, or other conditions, it is the responsibility of the passenger to contact Jet Set Express for more information. Should the passenger choose to utilize other means of transportation rather than wait for the Jet Set Express vehicle to be repaired or replaced, or rather than accept deviation from the estimated schedule times, Jet Set Express will not reimburse the passenger for any costs or offer compensation in any form. Children under the age of 15 are not permitted to travel alone. A birth certificate or state-issued photo identification will be required for young adults who appear to be in this age range to ensure the individual meets the age requirement. A seat must be purchased for each infant, child, and adult. Placing an infant or child on another passenger’s lap is not permitted. 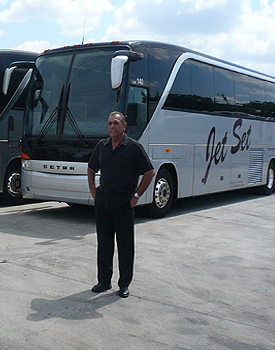 Our company reserves the right to deny service to any individual who disturbs the driver, passengers, or in any manner prevents Jet Set Express, Inc. from rendering its services properly. Outside food and beverages are not permitted on-board the motorcoach. All persons and carry-on and/or checked luggage are subject to search. Headphones are required when listening to music, watching movies/shows/videos, and talking on the phone. We kindly ask that you respect other travelers by minimizing phone calls and keeping a low volume throughout the trip. Luggage is limited to two complimentary checked bags, no more than 45 pounds each and no more than 27 cubic feet, and one carry-on per person. Overweight or oversized bags will be charged an additional fee of $10 per overweight or oversized item. Luggage covered in plastic wrapping is not permitted. To be permitted on-board, carry-on items may not have wheels and must fit in the overhead compartment of the bus or underneath the seat. If the carry-on does not fit as specified, it must be checked at the expense of the passenger. In the event of limited cabin space, passengers may be required to check carry-on items under the bus, at no charge. Each person is responsible for his or her own belongings while using our services. If a piece of luggage including its contents is valued at more than $100USD, upon check-in the passenger must inform the receptionist or driver, and supplemental insurance may be purchased. If supplemental insurance is not purchased during check-in, then Jet Set, Inc. will not be liable for any damages and may be liable for up to $100USD per piece of lost luggage. Under no circumstances should fragile and valuable items be packed in checked bags, but instead should be carried by the passenger. Refunds will be issued when requested at least 24 hours in advance. A $2 fee per passenger per one-way trip will be assessed. Credit card transactions that are charged back or disputed will result in permanent suspension from all Jet Set Express services. A report will be filed with the Florida Department of Transportation and may result in suspension from all transportation services in the State of Florida. If you missed the bus or did not travel for other reasons, please contact us at 407-649-4994 to resolve the situation.